What’s going on in a concussion? How could it affect us? What should we do about it? In recent years, physicians and scientists have learned a lot about concussions. Because of this new information, our approaches to treatment have changed. In this episode, a physician, a brain injury survivor, and a patient advocate outline what you need to know to take care of yourself or someone else after a knock on the head. The conventional wisdom in medicine is that more care leads to better health. Physicians have urged their patients to get their annual physical exams and regular screenings, in the interests of detecting certain conditions like breast or prostate cancer early. Research has shown, however, that many medical tests and procedures are unnecessary, a waste of money, and in some cases harmful. This edition of Physician Focus will examine the issues surrounding over testing, over treatment, and over diagnosis in medicine and what it means for patients. Their real names are difficult to pronounce, and they become known by acronyms such as MRSA or shortened names like C.diff. They are drug-resistant bacteria, often called “superbugs,” and are a major source of infections that can lead to serious illness and even death. The Centers for Disease Control says these ‘bugs’ cause one out of every seven infections caught in hospitals. They are now being detected beyond hospitals – in schools and other frequently visited locations in communities. How do these “superbugs” arise? What are the risks of these bugs? And what can individuals do to protect themselves? Health care is undergoing rapid change today, affecting hospitals, physicians, and patients alike in many ways. These changes are making the health care system increasingly complex, raising questions and confusion for patients. This edition of Physician Focus will examine some of the important factors patients should consider when making decisions about their health care. Technology is rapidly changing the practice of medicine, and one of the fastest growing areas is telemedicine – defined as the exchange of information via electronic means to improve a patient’s health. Telemedicine is quickly becoming integrated into hospitals, home health agencies, and physician offices. What are the advantages and disadvantages of these virtual visits? For the physician? For the patient? Can it replace the in-person office visit? When is it appropriate? When is it not? And how should patients regard this new approach to medical care? For more than a decade, obesity has been recognized as an “epidemic” in the United States. Despite great attention to this condition, overall rates of obesity in the U.S. have not declined. According to the U.S. Centers for Disease Control and Prevention, 35% of American adults are obesity and more than 6% have severe obesity. New research is showing that obesity is more complex than first thought. There is much more to obesity and weight loss than diet and exercise, and effectively treating this disease requires an understanding of many factors involved. Medicine has seen the rapid advance of information technology in recent years, affecting both physicians and patients. The adoption of electronic medical records has been swift: some 90 percent of physicians in Massachusetts now use some form of electronic medical records. What are the advantages and disadvantages of this new technology, for both physicians and patients? When it comes to individual health, men fare far worse than women: Men are twice as likely to die of heart disease, more prone to be killed or injured in accidents, and more likely to suffer from drug or alcohol addictions. What causes men to do so poorly as compared to women? What are the main health risks that men face? And what should men do to reduce those risks? Infectious diseases have plagued humans since the beginning of time, and the arrival of a new contagion brings uncertainty, confusion, and a race for a vaccine. The experiences of SARS in 2003, of H1N1 bird flu in 2009, Ebola in 2014, and now the Zika virus in 2016 are the most recent examples of threats targeting the public’s health. Groups such as the World Health Organization and U.S. Centers for Disease Control go on high alert for these threats. The media are quick to label them “epidemics” and “pandemics,” raising fears on the part of the public. Has media overreaction become the norm for these outbreaks? What roles do such agencies as the U.S. Centers for Disease Control play on the international stage in addressing these outbreaks. And just how should the public react? Colorectal cancer is the second leading cause of cancer-related deaths in the U.S., after lung cancer. The disease affects both men and women, and is most often found in people 50 years of age and older. Screening for this disease saves lives, but one in three adults – some 23 million people – between 50 and 75 -- is not getting tested as recommended. What are the causes of colon cancer? How is the disease treated? Why do so many avoid testing? And what are the best screening tests? The epidemic of opioid and prescription drug abuse and misuse continues to affect individuals and families across the Commonwealth, regardless of location, economic status, or age. In 2014, the state saw 1,089 confirmed cases of fatal opioid overdoses, a 63 percent increase over 2012 and a 20 percent jump over 2013. In the last five years, nearly 3,800 have died from overdoses, and in the last ten years, more than 6,700. This edition of Physician Focus will examine the factors that lead to opioid abuse, the effects the epidemic is having on residents of Massachusetts, what is currently being done - and what additional efforts might be undertaken - to curb the abuse. Skin is the largest organ in the human body, and it can be subjected to multiple disorders. Conditions such as acne, eczema, impetigo, psoriasis, rosacea, and melanoma affect millions of people. What are the most common skin disorders? What causes such conditions? What preventive steps can patients take to avoid these conditions? And how dangerous are they to overall health? Concussion has become a priority focus in healthcare, with particular attention to the world of sports, from the professional level down to the youngest of players. The severity and long-term health effects of concussions have been recognized by coaches, parents, players and fans at all levels. This Physician Focus program will examine aspects of concussions, their causes and health consequences, and what is being done by public officials, schools, and other groups to prevent and reduce their incidence, including new laws and regulations by states to protect players in school-based activities. In recent years, research into mind-body medicine has shown that psychological factors, such as our mental, emotional, and social states, can affect our physical health. Proponents of mind-body medicine say the practice of mindfulness can help improve health and be useful in managing illnesses chronic illnesses such as heart disease or arthritis. How do psychological factors affect our physical health? Just what is mindfulness and the mind-body connection? And how can using this approach improve our overall health? Heart disease is the leading cause of death in the U.S., accounting for nearly 600,000 deaths a year, with more than half of the deaths occurring in men. Yet cardiovascular disease – heart disease, stroke, and high blood pressure – is the number one cause of death in American women, claiming more women’s lives than all cancers combined. Why are women more threatened by heart disease than other illnesses? What are the gender differences that play a role in this condition? Are there differences among racial or ethnic groups? What is hindering preventive efforts? And what can be done to reduce the threat? Hearing loss is one of the most common chronic conditions Americans of all ages, with more than 30 million Americans age 12 and older having some level of impaired hearing, according to The National Institute on Deafness. What are the major causes of hearing loss? Who is most affected? What effect, if any, does hearing loss have on our overall health? What steps should we take to prevent hearing loss? And what remedies are available for those who lose all or part of their hearing? The problems children face growing up today, as viewed through the eyes of their parents and other adults, are vastly different than those from just a few years ago. The C.S. Mott Children’s Hospital of the University of Michigan Health System has conducted an annual national poll on children’s health, rating adult perceptions of “big problems” in children’s health. What do adults see as the “big problems” in children’s health? Do they vary among different racial and ethnic groups? Are they different from those that pediatricians see as major issues? And how do pediatricians counsel their patients and their parents on the biggest threats to a child’s health? Breast cancer is the most common cancer in women and second most common cause of death from cancer among American women. The standard for preventive care has been the mammogram, and death rates from breast cancer have dropped 34% since 1990 largely due to screening. Yet differing opinions from health professionals about such screenings have raised concern and confusion, and some research has indicated overtreatment of breast cancer – from false-positives and over diagnosis –costs billions each year. What guidelines should women follow about screening? What are the risk factors for breast cancer? Is genetic testing a prudent path to take? And what are the risks and benefits of preventive mastectomies? Eye injuries and disorders can occur regardless of age, but vision impairment increases rapidly with age, and as our population gets older, age-related eye diseases are expected to jump dramatically. Today, nearly three million people have glaucoma, and nearly 25 million have cataracts. And macular degeneration and diabetic retinopathy, currently affecting nearly 10 million people combined, are projected to double and quadruple, respectively, in the next 25 years. 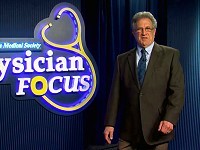 This edition of Physician Focus will discuss the major vision problems people over 40 may face, as well as examine the steps people of all ages should take to protect their eyes. Deaths and injuries from firearms continue to shine a spotlight on gun violence as a public health issue. Physicians believe gun safety should be a routine part of preventive care and have put forth proposals to reduce gun violence in America. Yet the issue is a flashpoint for controversy: laws banning physician discussion about guns with their patients have been passed, and the nomination of the U.S. Surgeon General was delayed for months because of his position on guns. Should gun violence or gun safety be considered a public health issue like infectious disease, tobacco, obesity, or traffic safety? And, if so, what role should health care, and specifically physicians, play in advocacy? Dementia describes a group of cognitive disorders primarily affecting older adults and is usually marked by difficulty with language, motor activity, and the ability to plan and organize. The most well-know of these conditions is Alzheimer’s disease, currently affecting 5.3 million Americans. The number of patients with Alzheimer’s, however, is increasing rapidly along with an aging population, and estimates are that by 2050, up to 16 million people will be afflicted. The impact of this condition on a patient is slow and tragic. Yet the effects of dementia go far beyond the patient. What should families consider when confronted with a diagnosis of Alzheimer’s? What difficulties will patients and families face? And what resources are available to help them? Diabetes is one of the country’s most prevalent chronic conditions, affecting nearly 29 million Americans. The disease is now the 7th leading cause of death in the U.S. and contributes to a variety of other conditions such as heart disease, blindness, and kidney disease. Why and how has this chronic condition become so prevalent? What steps should be taken to reduce this epidemic? What are the latest treatments available for patients? And are we close to a cure? Cancer is the second leading cause of death in the U.S. after heart disease. Recent reports have indicated that most cancer types are just the result of “bad luck,” or chance mutations of cells. Other reports and research indicate that lifestyle choices, genetics, and the environment play important roles. How does cancer occur? Are the causes different for different types of cancer? What are the known risk factors? Can the disease be prevented? How much does the American public really know about cancer? The current measles outbreak, in large part due to unvaccinated individuals, has prompted renewed concern by physicians and public health officials over vaccines and immunization. How and why are these diseases making a comeback? Why are patients and their parents avoiding vaccines in the face of scientific evidence of their preventive value? What are the risks of vaccination? What are the risks of not getting immunized? And what can physicians do to reinforce the importance of vaccines for both children and adults, called one of the ten greatest public health achievements of the 20th century? Abuse of opioids and prescription drugs has become a national public health problem in the United States. Many efforts – legislation, regulations, restrictions, prescription monitoring programs – have been undertaken by government officials, law enforcement, and health providers at all levels to reduce the problem – with varying results. At the same time, many patients are experiencing chronic pain, and patients and providers alike are concerned that overreaction will deprive patients of needed medications. What is the physician’s perspective of prescription drug abuse? What do those who treat the patients and write the prescriptions think should be done to reduce the problem? What are the responsibilities of physicians when prescribing and patients when using opioids? The Centers for Disease Control estimates that more than 20 million Americans – about 10 percent of the adult population – have chronic kidney disease. Adults with diabetes and high blood pressure, two of the most prevalent medical conditions in the country, are at higher risk for developing CKD than others. The chances of having CKD also increase with age, and as the population ages, the incidence of CKD is likely to increase. What causes this condition? How is it detected? What implications does it have for overall health? Can it be prevented? And what are the treatments available for it? The food one eats has an enormous effect on one’s health, yet many consumers, bombarded with study after study about what’s good and what’s bad to eat, are confused. In some cases, the studies offer conflicting information. This program will look at such questions as: What IS the impact of food on our health? What constitutes healthy food? Is organic food really better? Is food from Genetically Modified Organisms (GMO) safe? How can consumers become more aware and more knowledgeable about the foods they buy and eat? Chronic diseases, long-lasting conditions such as heart disease, diabetes, HIV, asthma that can be controlled but not cured, are a leading cause of death and disability in the U.S. and in total affect some 90 million Americans. Traditional care has focused on the physician’s role in caregiving, but a new model of care is emerging: patient self-management, where patients become their own principal caregivers. What are the principles behind this new model? Will patients embrace it? And what advantages does it bring - to the patient, to the provider, to the health care system? Human Papillomavirus is the most commonly sexually transmitted disease, currently infecting about 79 million Americans, with 14 million becoming newly infected each year. HPV can lead to certain cancers, including cervical cancers and head and neck cancers. This program will look at such questions as: Why is this condition so widespread? Who is most at risk for this disease? How is the disease detected? How can the number of infections be reduced? And what treatments are available for those who get the disease? Despite Federal law prohibiting the drug and lack of approval by the Food and Drug Administration, the use of marijuana as medicine is now permitted in Massachusetts as well as several other states. Yet the debate continues on many topics: What are the health risks associated with its use? What is the drug’s effectiveness as a therapy for medical conditions? This program will look at those questions and others, including what the available science says about the drug, and what patients should know if they are considering using it for medicinal purposes. Physicians are trained to promote wellness, cure illness, and preserve and protect life. Yet, death is inevitable, and health care providers are now paying more attention to end-of-life issues. One of the most important aspects of end-of-life issues is preparing advance directives. These include such items as a living will, health care proxy, durable power of attorney. Why should people prepare advance directives? What do they signify? How difficult are they to prepare? And how do they benefit the patient, family members, and health care providers? They’re invisible to many citizens, but the work of the local boards of health in communities across the state is critical to our collective well-being and safety. This edition of Physician Focus will take an in-depth look at public health efforts at the local level by examining how local boards of health operate. What are the responsibilities of these boards? What kinds of power do they have? How, exactly, do they operate? Who are the people who watch out for our health and safety? And how do they interact with state public health officials? The familiar ones are with us each year – West Nile virus, Easter Equine Encephalitis, Lyme disease. But outside of the U.S., unfamiliar infectious diseases like Chagus disease, dengue, Ebola, and Chikungunya virus – continue to affect millions around the world. And some are getting closer to the United States. How dangerous are these diseases? What are the biggest threats of infectious disease facing the U.S.? And how are public health officials acting to safeguard against them? The U.S. Surgeon General’s first-ever report on oral health in America, issued in 2000, declared that oral diseases remain prevalent across the country, and that, for some populations, the lack of oral health was a “silent epidemic.” Evidence has shown that oral health and physical health are linked, and that oral complications are associated with respiratory disease, cardiovascular disease, and diabetes. How far have we progressed since the Surgeon General’s report? What are the factors contributing to a lack of oral health? How do we improve people’s oral health? And how can physicians and dentists work together on behalf of the patient? A dozen years ago, the Institute of Medicine issued its report, Unequal Treatment: Confronting Racial and Ethnic Disparities in Health Care, pointing out that racial and ethnic minorities receive poorer quality care than white patients. What’s causing this unequal treatment? What can physicians and patients do to improve their care? And how much progress have we made since the IOM’s landmark report? In 1981, the Centers for Disease Control described a rare, then-unidentified lung disease affecting the immune system. It was the first official reporting of what would come to be known as human immunodeficiency virus, or HIV that leads to AIDS. Today, about 50,000 people in the U.S. get infected each year with HIV, and many do not know they are infected, and some 15,000 people die each year from AIDS. Worldwide, the figures are even higher. How far have we come in more than thirty years in our fight against HIV and AIDS? Crohn’s and colitis are chronic diseases of the intestines, each affecting as many as 700,000 people in the U.S. What are the causes of these conditions? Who is most affected? How does it affect health and quality of life? And what treatments are available for these diseases? January 2014 marks the 50th anniversary of the first Surgeon General’s report on the dangers of smoking and tobacco. While much progress has been made in getting people to stop using tobacco, smoking remains the leading cause of preventable death in the U.S. As the nations’ physicians refocus on anti-tobacco efforts, it’s time to review the impact of tobacco is having on our health and what can be done to continue to reduce the rate of smoking among all ages. The killings in Aurora, Colorado and Newtown, Connecticut in 2012 and at the Washington Navy Yard in 2013 are the latest in a long list of mass shootings in the U.S. that have called attention to the link between mental illness and violence. In recent Gallup polls, nearly half of Americans – 48% - blame the mental health system “a great deal” for mass shootings. What exactly is the relationship between mental illness and violence? And what role, if any, might mental health professionals play in reducing violent acts? Hepatitis is one of several diseases affecting the liver, the largest organ in the human body that aids in critical functions of the body. Nearly four and half million Americans are living with chronic hepatitis, and most are unaware they are affected. What causes this condition? What are its symptoms? How is it diagnosed and treated? Who may be susceptible? And if left untreated, what consequences may occur? The hospital emergency department has become a mainstay of American medical care. An estimated one of every five Americans visit the ER each year, for a total of nearly 130 million visits annually. With only 4 percent of the nation’s physicians, emergency departments manage more than 10 percent of outpatient hospital visits, handling a wide range of medical challenges, often under difficult circumstances. What are the decisions emergency physicians and nurses face when patients present themselves? What should patients consider when thinking about visiting an emergency department for medical care? What is the role of the emergency department in today’s health care system? And what challenges do they face? The physician-patient relationship is regarded as the foundation of good health care, but medicine is constantly evolving and changing, and so, too, does the physician-patient relationship. How has this relationship evolved over the years? What elements make up a good relationship today? Will the relationship change with the move to “medical homes” and accountable care organizations? What should patients think about when seeking a primary care provider? The loss of a loved one affects each of us deeply and moves us to mourning and bereavement following their death. After a period, most people gain acceptance of their loss and move forward with their lives. Some, however, are affected by complicated grief, a clinically significant and potentially debilitating condition. What are the causes of this severe grief? Who is at risk? What are the symptoms? How can it affect one’s health? And what kind of help is available to those who experience this condition? Weight loss surgery has been touted as one solution to the problem of obesity, and in some cases, it’s also been known to eliminate diabetes. It’s a complex undertaking, however, that involves a lifetime of commitment, discipline, and attention to detail. Who are the best candidates for these procedures? What steps does a patient need to take for success? What are the surgical options available and what are the differences between them? What results can a patient reasonably expect, and what are the risks? The bombing at the Boston Marathon is the latest example of the role medical professionals and first responders play in meeting unexpected events. Whether natural or man-made disasters, medical personnel seem always ready to react quickly, to save lives and care for those in harm’s way. What goes into preparing for such events? What kinds of training and resources are necessary? And what is the impact on physicians, nurses and other first responders? The number of joint replacements is soaring in the U.S., as more than a million people year are getting total replacements, usually for their hip or knee. As baby boomers age with arthritis and other conditions but still wish to remain active, these operations are expected to continue to increase. Who are the best candidates for these replacements? How expensive are they and how long do they last? What should patients know, pre- and post-surgery, about these procedures? And how successful have they been? The value of regular medical check-ups and screenings has come into question, dividing the medical community and causing confusion among patients. Independent groups such as the U.S. Preventive Services Task Force and The Cochrane Library in Europe say there’s little evidence that check-ups and screenings reduce health risks and can even do harm. Some physicians disagree. What’s prompting this divide within the medical community? How should patients react to this information? And what advice should they follow? From bullying by their peers to sexual abuse by adults to actions portrayed in multiple forms of media, our children are being exposed more and more to violence. What is causing this? What steps can parents take to protect their children? How does it affect the physical and mental health of our children? And what role can the physician play in addressing and reducing youth violence? Depression is a chronic mental illness that affects one in ten adults in America and is a leading cause of disability for individuals 15 to 44. Though women are much more likely to experience depression, the illness can reach anyone, regardless of social, ethnic, or economic status. What causes this mental illness? How is depression diagnosed? Is there a link between depression and other diseases? And what are the treatments to address this condition? The medical conditions associated with obesity, such as diabetes, heart disease, high blood pressure, and osteoarthritis, are too costly and too common, and are brought on in large measure by the lifestyles we lead. How active we are, our use of substances such as tobacco and alcohol, and particularly the foods we eat – are major causes of obesity and overweight.